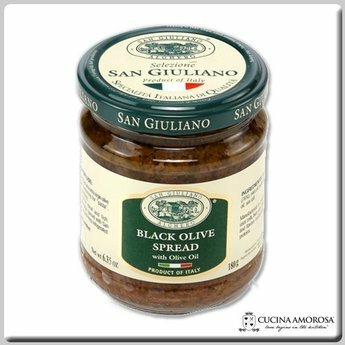 San Giuliano Black and Green Olive Spreads are an excellent aperitif and a tasty condiment, ideal for anyone wishing to enjoy the traditional taste of olives blended with olive oil. Perfect for those who appreciate freshness and lightness. 100% natural with no preservatives or coloring. Ingredients: green olives (84%), olive oil, salt. Suggestion for use: Diluite paste with extra virgin olive oil to get a typical seasoning for pasta, sandwiches, pizza, savouries, etc. Excellent flavoring for meat and fish.